Published in Rafu Shimpo, June 7, 1969, Japanese section. 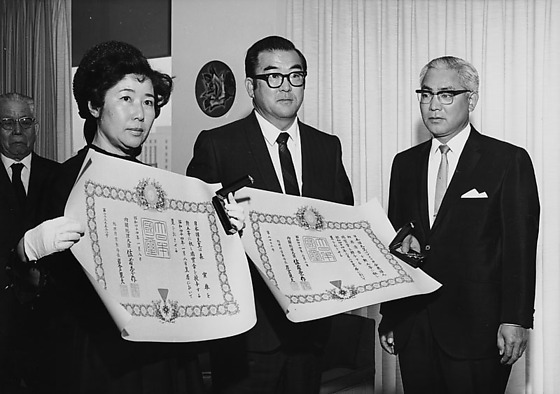 Consul General of Japan, Kanji Takasugi, presents Fifth Order of the Sacred Treasure, or Kunsho (medal) award, on behalf of the Japanese government to Teiko Mori, widow of the late kendo instructor Torao Mori, and Louis Aihara, the son of the late influential farmer Seikichi Aihara, at his office in Los Angeles, California, June 6, 1969. Takasugi is white-haired with dark eyebrows, eyeglasses and wears a dark suit with light necktie. Includes Takasugi presenting certificates, posing with recipients and toasting with sake cups with small group of people, including Katsuma Mukaeda. Typed on original envelope: Kunsho Ceremony -- Con Gen Office -- Mr. Aihara -- Mr. Mori.